Jersey is a fascinating blend of both British and French influences. It’s also the largest of the Channel Islands, and the financial capital, so there is a bit of glitz and glamour along this 48miles worth of impressive coastline, as well as a mix of rugged cliffs and sandy beaches. With plenty of walking and/ or cycling tracks between them. Views are key here, and most of our Guru’s recommendations for the best places to stay in Jersey have breathtaking ones. Jersey’s position as an offshore finance centre has influenced recent design - there's lots of glass and steel shooting up beside more traditional looking seaside resorts and grand hotels. There are also a number of flash bars and restaurants - including three which have been awarded a Michelin star - to spend any excess finance in. But the island’s history, especially during WW2 when it was occupied by the Germans, is another huge draw for visitors. Jersey’s climate feels almost tropical compared to the rest of the UK, and as a consequence it's a hugely popular summer holiday destination. The range of properties on the island is wide but our selection of the best places to stay in Jersey offers something for everyone from grown up luxury to family friendly beach front resort. Stories of Jersey’s dramatic WW2 occupation are recounted in the rather spooky surrounds of the Jersey War Tunnels Museum, a series of underground tunnels, dug using slave labour. You’ll come across ruined gun emplacements and bunkers still visible along the coastline. Families will be interested to hear that Jersey also has a renowned zoo, founded by famous naturalist Gerald Durrell, which has a focus on protecting endangered species, and breeding them for release. Jersey is small, only nine miles by five, but it’s got two castles, well this is still part of the Dukedom of Normandy! Mont Orgueil Castle dates from 1204 but has been regularly modified, most recently by the Nazis. Elizabeth Castle is a charming 16th century castle overlooking St Aubin’s Bay. Jersey also has several museums and a lavender farm. And then of course there are the rest of the Channel Islands to explore - a real time travelling experience, considering some of them don't even have cars or streetlights! Do plan ahead if you want to book a summer holiday - the best places to stay in Jersey will get booked up way in advance. Alternatively come in the quieter months and really get to know this special island. If you're looking for a room with a view, and a Michelin star try The Atlantic Hotel on Jersey. There's a spa and gym, tennis courts, indoor and outdoor pools, and a golf course just next door. There's also great walks starting from just outside the door. This resort will keep you busy for an extended stay. Another of Jersey's Michelin stars can be found at The Club Hotel & Spa, a 'city style' hotel in the centre of St. Helier. As the name suggests the vibe is modern and boutique-y. Built in the 14th Century, Longueville Manor and estate has been carefully converted, over the course of seven decades, into an excellent boutique hotel. Here care is taken over everything, and the result is unfussy luxury. 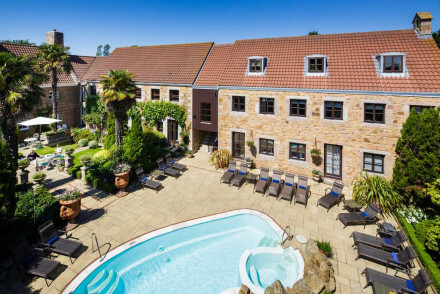 If you're looking for somewhere to install your family on a traditional seaside holiday, one of the best places to stay in Jersey is L'Horizon Hotel & Spa. 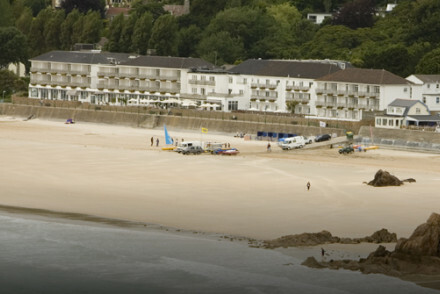 Right on the beach of St. Brelade's Bay, this hotel has been booking families into its sea-view rooms since 1850. Of course it's totally modernised now, and even has a spa and heated, indoor pool for when the weather is a bit disappointing. If you’d prefer to stay in a self catering house or private apartment we recommend you visit our online partner, booking.com. If you’re in the UK it’s really easy to get to Jersey. Jersey Airport, which is about 7kms northwest of St Helier, is connected to many UK airports. Or you can catch a ferry - complete with your fully packed car if you like - from Poole, which takes about four and a half hours, or Portsmouth, which takes about eight hours. Jersey’s weather is similar to that of the UK and Normandy, but with a bit more sunshine and a bit more rain. There are four distinct seasons: dry summers where maximum temperatures are around 19°C, cooler; wetter autumns, with average maximum temperatures 18°C in September, but down to a frosty 11°C in November; cold, frosty winters, where temperatures hit maximums of 7°C or 8°C; and wet springs which take a while to warm up, but which are pleasant when they do. Summer is definitely the best time to go if you’re looking for the long, sunny days the island is known for. Still not sure which is the best place to stay on Jersey for you? 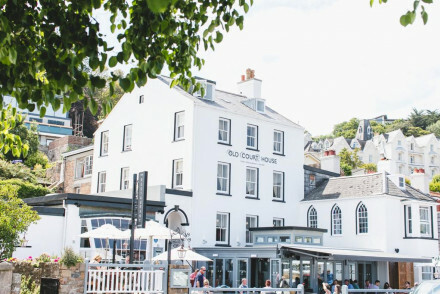 A boutique B&B in an historic building overlooking St Aubin’s Harbour. Small, but immaculate rooms, with cheerful retro styling; a lively bar with al fresco terrace and a popular restaurant. Local exploring - A cosy spot to return to after a day exploring the island. Great walks - Explore the island on foot along the picturesque coastal paths. Sights nearby - Make a trip to the impressive Elizabeth Castle. 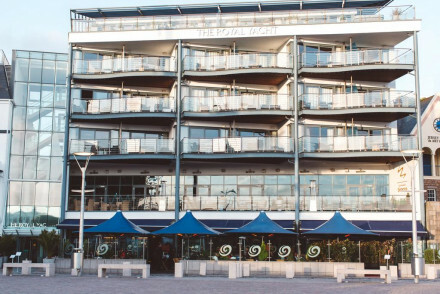 A super-sleek town-centre hotel offering the full boutique experience: stylish and well-equipped rooms, tranquil spa and swimming pool, a range of excellent dining options and some of the best nightlife in St Helier. Ideal for weekend breaks. Total relaxation - Complete with spoiling spa, excellent service and three restaurants to choose from. Ideal for a relaxing weekend away. Surfing - The west coast beaches which face the Atlantic Ocean and are ideal for surfing. Sights nearby - Visit Elizabeth Castle a 16th century fortress on a rocky islet. 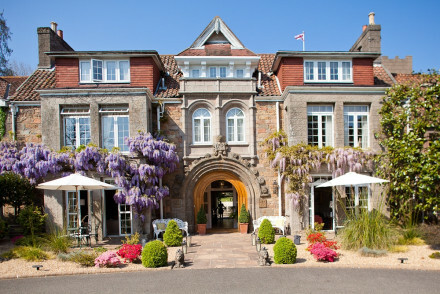 A country house hotel tucked away in the verdant heart of Jersey. Rooms mix contemporary and traditional styles with crisp white linen and hints of tartan fabrics. This is the place for a quiet getaway; enjoy the garden bursting with flowers, the tranquil outdoor pool and the characterful bar. Country Escape - Located in the rural heart of Jersey boasting a pretty floral garden, roaring fires and warm welcome. Great walks - Explore the island on foot on long walks along the coastal path. Surfing - Find superb surfing conditions on the island's west beaches. 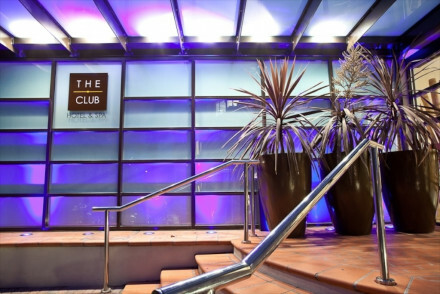 Chic hotel in the heart of St Helier with a top spa & Michelin starred restaurant. Sleek contemporary styling in the bedrooms. A good choice if you want to stay in the heart of the action. Restaurant - Bohemia Restaurant holds one Michelin Star. Beach front property overlooking St Brelade's Bay. Spacious rooms many with great views over the bay. Plenty of dining options plus spa and health club. Ideal for a family seaside holiday. Stylish hotel with stunning views and Michelin starred dining overlooking St Ouen's Bay. 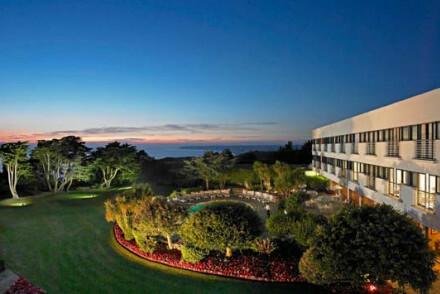 Golf next door, and extensive spa facilities make this a great resort hotel for an extended holiday. Views - Lovely views of the Atlantic ocean. 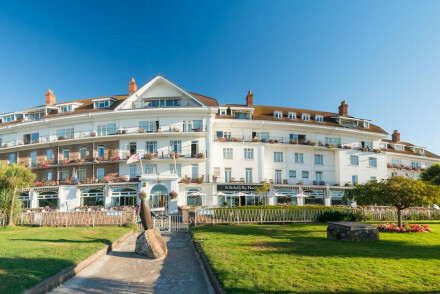 A Grande Dame of Jersey hotels, St Brelade’s Bay has been serving up luxury island stays since the 19th century. Go for exemplary service, historic interiors, exhilarating sea views and summer afternoon teas in the garden. Total relaxation - A coastal property complete with top-notch service, a spoiling spa and quiet location. Great walks - Explore the island by foot on long walks along the coastal path. Country estate style 14th century manor house hotel with lovely gardens around a pool. Excellent facilities including tennis court & croquet lawn, and fine dining. Four poster beds and traditional, luxury furnishings. Deeply comfortable.